Cycling in Nashville, originally uploaded by jcarter. 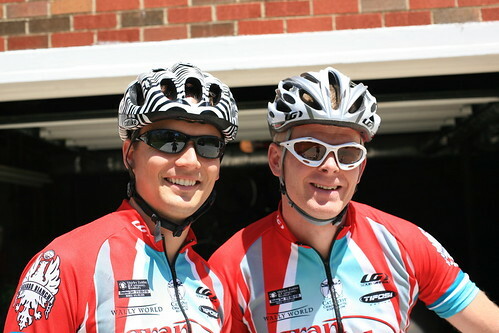 On the day after the Country Music Half Marathon, Rob took me on my first cycling adventure. I got to wear the full Gran Fondo getup, all the way down to the socks, so I actually looked like I knew what I was doing. It was much harder than I expected. The trickiest part is learning how to clip in and out of the pedals. I took a spill at the very beginning but got the hang of it after that. We went for a 15 mile ride over some small hills that felt like mountains. I have great respect now for the hills cyclists climb during races.